This is a small Java 1.5 application that can find duplicate files on your hard drive. If you're worried about unnecessary files being stored on your hard drive, this program can find those files that are identical. It works by first comparing file sizes, and for those files that are equal in size it calculates a checksum from the data in the files to see if they match. It is distributed in a runnable JAR file, so in Windows, double-click should do the trick. Acknowledgements: This application uses FileDrop to handle drag and drop with files, and swing-layout for laying out components. 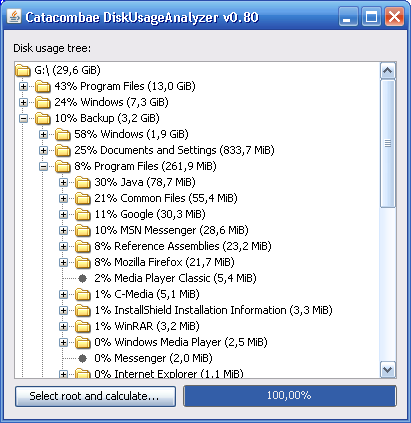 This application goes through your files, starting at a specified root folder, and calculates the weights of the subtrees based on the amount disk space that they occupy. jFUSE is a Java binding for FUSE, Filesystem in USErspace. It is under development but seems to work for simple test cases on Mac OS X, Linux and FreeBSD. More platforms will follow. Requirements: A computer running Mac OS X, FreeBSD or Linux (Ubuntu 9.04 has been tested), a Java runtime environment (minimum 1.5), libfuse (MacFUSE on Mac OS X). Mac OS X users get a precompiled universal library, while Linux and BSD users will have to compile the library themselves.